The Hélicoptères Guimbal Cabri G2 is a two-seat piston engine helicopter in the small rotorcraft category. The airframe and tail boom of the helicopter are all-composite; the main landing gear is composed of two tubular bows, and two skids. The Cabri G2 is powered by a single Lycoming O-360 J2A engine; the main rotor is a fully articulated, high inertia three blades rotor system, and the helicopter has an seven blades fenestron tail rotor. The Cabri G2 is primarily the result of a personal adventure: it was completely designed and developed by Bruno Guimbal, then a young engineer at Aérospatiale Hélicoptères. Since the first draft while he was still at l’École Supérieure des Techniques Aérospatiales (High School of Aerospace Technology), the various stages of this project were achieved gradually. Bruno Guimbal gradually found the support of his company (then Eurocopter-France-ECF) and G2 prototype c/n 01 made its first flight as F-WILA at Marseille-Marignane on 11 April 1992. This G2 protototype and demonstrator was powered by a single Lycoming O-320 E2A engine and was tested for four years, first in ECF-Marignane, then by Bruno Guimbal personally, after the teething problems had been resolved. On 18 April 1994, restricted DGAC certification was being issued for the G2 and the registration of the G2 c/n 01 changed to F-PILA on 4 July 1994. The airframe totalizing nearly 150 flight hours with 18 pilots, and since 22 May 1996, the Cabri G2 has held the world record distance for a helicopter under 500 kg with a distance of 481,32 km. In 1998, the Cabri G2 c/n 01 was withdrawn from use, but this was not the end of the airframe as in 1999, the dynamic set (rotor and tailboom) were used for the Eurocopter/Guimbal Orka 1200 maquette. In view of the excellent performance of the machine and the potential market, the company Hélicoptères Guimbal SA was created in October 2000, to continue studies to define a serial device and industrialize the production of the Cabri G2. The pre-production model c/n 1001, the first Cabri G2 out of the workshop of Hélicoptères Guimbal at Aérodrome d'Aix-en-Provence, therefore incorporates advances made on the prototype F-PILA in a view of industrialization. Guimbal Cabri G2 c/n 1001 F-WYHG, flew first at Aix-en-Provenceon 31 March 2005. Already on 18 August 2005, the F-WYGH had established three official world records in its class: Height attained without a payload 6,658 mtrs; Duration of a climb to 3,000 mtrs - 6 min 42 sec. ; Duration of a climb to 6,000 mtrs - 22 min 6 sec. Hélicoptères Guimbal received the first orders for the Cabri G2 in June 2006 and EASA certificate was applied for on 21 December 2006. On 14 December 2007, the Hélicoptères Guimbal Cabri G2 received EASA type certification No. EASA.R.145. On 22 September 2008, the first production Guimbal Cabri G2 (c/n 1003) was delivered as F-GXRU to iXair in Paris, France. On 30 January 2015, the Hélicoptères Guimbal Cabri G2 received the FAA type certificate. Today, over 100 Guimbal Cabri helicopters are built and delivered to customers all over the world. The 2010-built Guimbal Cabri G2 c/n 1010 was tested with the Hélicoptères Guimbal test registration F-WWHG. On 6 May 2010, the aircraft was registered D-HJOY in Germany with Aero-Dynamic, Flugplatz Waizenhofen. On 25 February 2014, registration D-HJOY was cancelled as exported to the Netherlands. 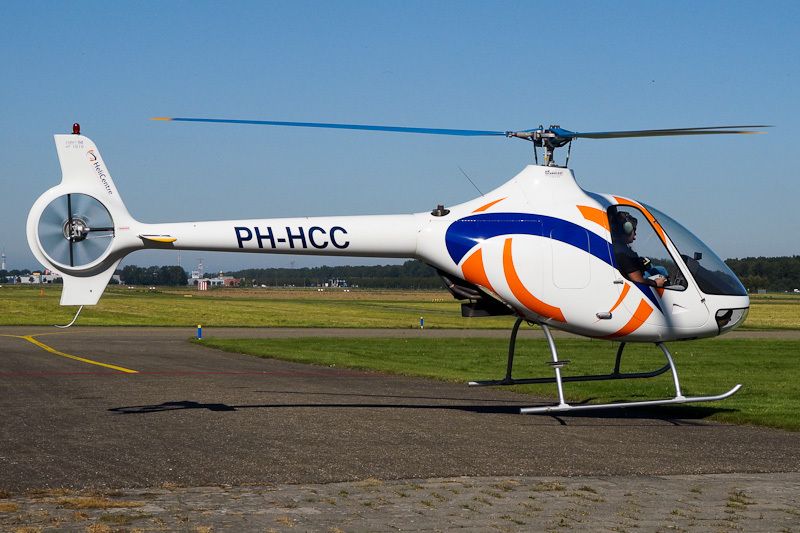 On 20 March 2014, the Guimbal Cabri G2 was registered PH-HCC with HeliCentre Invest BV, Lelystad. Guimbal Cabri G2 PH-HCC was delivered all white at Lelystad. When seen at Lelystad Airport, Guimbal Cabri G2 PH-HCC wear the HeliCentre colors and titles.